CBSE NEET 2018: After conducting the NEET UG 2018 exam successfully Central Board of Secondary Education (CBSE) has announced the Official NEET Answer Keys for all set of question papers in all languages. NEET UG 2018 examination was conducted in 11 regional languages (English, Hindi, Telugu, Assamese, Gujarati, Marathi, Tamil, Bengali, Kannada, Oriya, Urdu). According to the CBSE, around 13 lakh plus candidates appeared in this examination. Now all those who have given the exam are waiting for the NEET UG Results, Merit List & NEET Counselling 2018. Article Category CBSE NEET UG Results, Merit List & NEET Counselling 2018. 12:36- Result has announced. Check it from below link. 4th June 10:55 AM- According to the Anil Swarup, Secretary, @HRDMinistry, Government of India, NEET Result 2018 will be announced today. In order to get admission through NEET exam, candidates have to clear this entrance exam with good score. Candidates who will score good marks in the exam will be listed in the merit list of All India Quota and state quota. Central Board of Secondary Education will announce the NEET Merit list only for 15% reserved medical & dental seats under All India Quota. The merit list of the rest 85% reserved seats will be announced by the states. Remember, state quota merit list will be published separately by all states. All Eligible candidates will be able to get it from their regional concern official website. Below we have listed all state’s NEET 2018 Merit List status. As we know, Cut off is the minimum possible marks a candidate must score in order to crack NEET 2018 Exam. According to the previous year’s schedule, CBSE will declare the NEET Result 2018 along with the cut off marks for all categories. The list of qualified and non-qualified candidates will be available on the official website of CBSE NEET 2018. The basic rule is the percentile in which all the value of the percentage of students appearing in the examination come under. 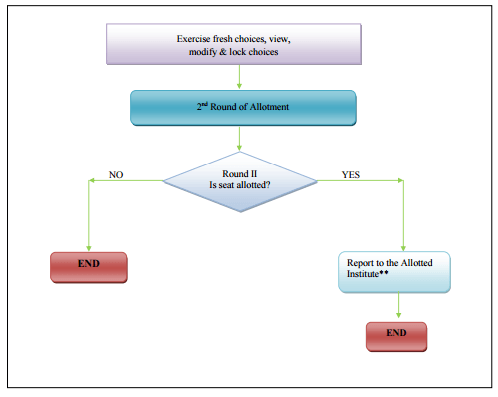 It can also be considered as the score in which the candidate’s marks fall under. Marks categories are determined differently based on the student’s category for e.g. :-(OBC, SC, ST, PH-UR, SC-PH and Others). Below, we have made a table including NEET Expected Cut off Marks 2018 for all states. We made this cut off on the previous year’s data. The final cut off will be published later after the NEET Result 2018 announcement. The Medical Counseling Committee (MCC) will announce the counselling schedule of NEET 2018 on their official website. Candidates will be called for the counselling on the basis of their score and rank. For more details, all candidates are suggested to keep their eyes on the official website of MCC as well as here. NEET is the national level Medical entrance exam which is conducted by Central Board of Secondary Education, Delhi for admission to MBBS/BDS courses in Medical/Dental Colleges run with the approval of Medical Council of India/Dental Council of India under the Union Ministry of Health and Family Welfare, Government of India. * Facility for Registration will be available before Round-1 only, on dates as specified in Counseling Schedule. ** Joining at allotted Institution is necessary if candidate allotted seat fails to join the allotted college/seat within the stipulated time, before the last date of joining (as per counselling Schedule), then allotted seat will be canceled and the candidate shall not be eligible to take part in further Rounds of the online Counseling. NOTE: It is to be noted that the data mentioned is taken from the previous year and then taken average dates when students can expect the counselling rounds to start. We will update this page as soon we gather the exact dates from the officials. so don’t forget to come back. So you can bookmark us to save our site in your browser. What are the neet required documents 2018? 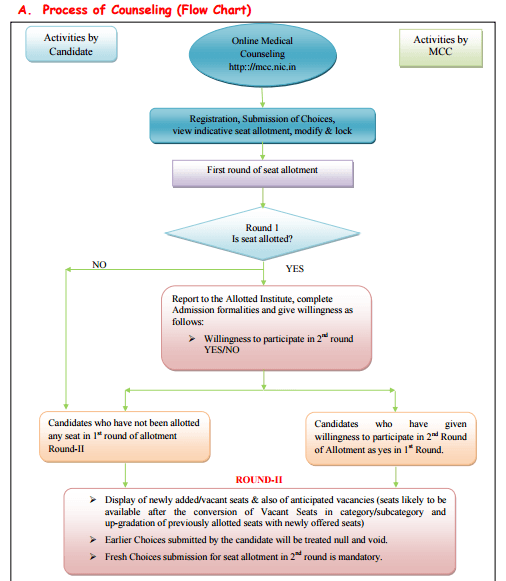 Candidates should have original documents (along with attested photocopies of documents) for admission to undergraduate medical courses for admission to 15% of total seats on all-India basis and state 85% based seats are required at the time of joining in allotted Medical / Dental College are as mentioned below. Below we are providing the required documents for verification after seat allotment. To confirm your MBBS/BDS seat make sure you have all original copy of listed below documents. Admit Cards of Exam issued by Central Board of Secondary Education (CBSE). Result/ Rank letter issued by CBSE. Six (6) Passport size photograph same as affixed on the application form. (a) SC/ST Certificate issued by the competent authority (in the standard format as specified in the prospectus/information bulletin) and it should be in English or Hindi in language. Subcaste should be clearly mentioned in the certificate. Some of the States insist for the English version of Caste Certificate. (b) OBC certificate issued by the competent authority. The sub-caste should tally with the Central List of OBC. The OBC candidates should not belong to Creamy Layer to claim OBC reservation benefit. The OBC certificate must be in the standard format as mentioned in the Prospectus/ Information Bulletin. (c) Orthopedic Physical Disability Certificate issued by a duly constituted and authorized Medical Boards. (Please see clause 10.1 of Information Bulletin of AIPMT, for admission to MBBS/BDS Courses, published by Central Board of Secondary Education (CBSE) for details). No other PH certificate, issued by any other Authorities/Hospital will be entertained. (Candidates are advised to see college information, of allotted college for, any other document which may be required by the allotted college). Candidates without original certificates/documents shall not be allowed to take admission in allotted Medical/Dental College. All Candidates who have deposited their original documents with any other Institute/ College/University and come for admission with a certificate stating that “their original certificates are deposited with the Institute / College /University” will not be allowed to take admission in allotted Medical/Dental College. According to the Medical Council of India, the Eligibility Criteria of NEET is as given below. (a) The candidate must have passed Physics, Chemistry, Biology/Bio-technology and English individually and must have obtained a minimum of 50% marks taken together in Physics, Chemistry, Biology/Biotechnology. (b) For SC, ST and OBC Candidate: The marks obtained in Physics, Chemistry, Biology/Bio-technology taken in qualifying examination and competitive examination (Physics, Chemistry, Biology/Bio-Technology) be 40% marks instead of 50% for General Candidates. The PWD persons with locomotors disability of lower limbs, the minimum of 45% marks for Gen-PH and 40% marks for SC-PH/ST-PH/OBC-PH are required. After the result publication, Medical Counselling Committee will announce the NEET counselling schedule 2017 on their official website. Remember that, MCC will only conduct NEET Counselling for 15% All India Quota MBBS & BDS seats. Rest of 85% of govt. & private MBBS/BDS seats will be filled through the state quota counselling. All states will publish their own merit list and conduct own counselling. Candidates will be called for the counselling on the basis of their score and rank. For more details, all candidates are suggested to keep their eyes on the official website of NEET as well as here. Final Word: Subscribe and like us for all latest updates of NEET 2018. 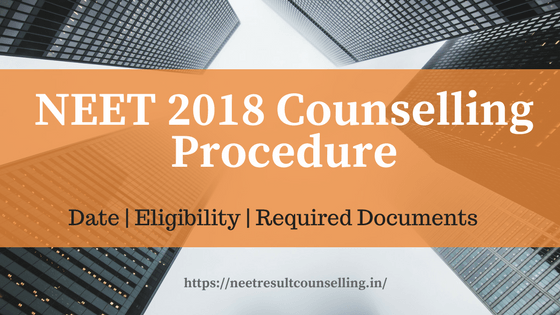 If anyone has any confusion, query or problem regarding NEET Result 2018, How to check result or neet 2018 Counselling then feel free and ask us in below comment box. We will gladly help you. All the best CBSE NEET Counselling 2018 !